This spring, John W. Boyer, AM’69, PhD’75, was appointed to an unprecedented fifth term as dean of the College. 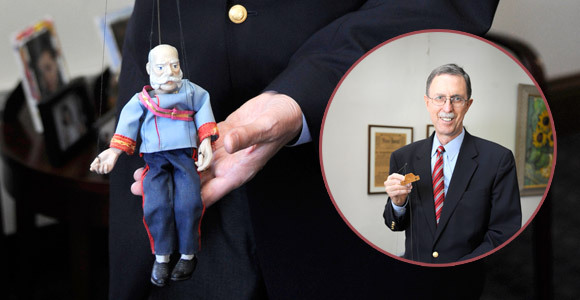 Boyer, whose academic specialty is 19th-century European history, spoke with the Core about his favorite Habsburg, the Emperor Franz Joseph I (shown above in the dean’s office). What is one mistake Franz Joseph made that you would never make? He was the emperor who declared war on Serbia, which led to World War I, which led to the collapse of the Habsburg Empire. In a way, he bears responsibility for the collapse of an empire that his family had ruled for 600 years. I would hope that my deanship does not in any way contribute to the decline and fall of the University of Chicago—although some skeptics in the 1990s, as we began to plan the increase of the size of the College, were accusing me of just that. The Empire was a multinational empire held together by an extremely effective and relatively honest civil service and local government. It was a very decentralized empire, and it had to be, because of the multiple ethnic groups that constituted it. The College is similar. To make it work, you need coherent, responsible local government—really effective department chairs, Collegiate masters, chairs of Core courses. Much of the heroic day-to-day work is done by these local leaders. Whatever larger plans one has about moving the institution in one direction or another, you have to have their buy-in and support. Otherwise your reforms are likely to be short-lived, perhaps even disastrous. I could give you more particularistic examples, but only the students who have taken my graduate-level course on the Habsburg Empire would understand. I’m told that the Emperor sometimes makes an appearance during dinner parties. Yes. When I have students over for dinner, it’s usually a buffet. We have a large apartment, but we can’t seat everybody. Now, if you were invited to dine at the Hofburg or the Schönbrunn, you were seated at large formal tables, and the emperor was always served first. He was a light, quick eater, but the protocol was that when the emperor put down his fork, everybody did. Many of the guests, especially those seated at the end of the table, got nothing to eat. People knew that, so they would make reservations at a restaurant for later in the evening. I always tell the students, in contrast, there’s no protocol, and there’s seconds for anyone who wants them, so have at it. You don’t have to go to a restaurant after coming to my house. How did the Emperor come into your life? He was given to me by a graduate student who bought him at a flea market in Vienna 20 years ago. He’s served me well. He probably needs to be dry-cleaned, but it would destroy his uniform. He’s aged with me and my deanship. He’s become my pal. I admire him and he’s still going strong, so I am too.